While Miami knows how to stay busy — from boating and dining, to shopping and a night out on the town — at its heart, this is a laid back beach city where the value of some rest and relaxation are well understood. Miami is home to some of the best spas in the Americas, and its hotels — thanks to distinctive Art Deco architecture and beachfront locales — are some of the most unique. Combine the two, with amazing spas in beautiful hotels, and you have a match made in heaven. Here are the places to relax, recharge and slumber when visiting Miami. So leave your boat in the new superyacht marina and indulge in a treatment or two. The Spa at Mandarin Oriental Miami The Mandarin Oriental’s spa sprawls over three floors and offers six VIP spa suites, with floor-to-ceiling windows overlooking the bay, that are available hourly with unlimited spa services creating the ultimate luxury experience. Pair one of the signature Mandarin Oriental therapies with the Ayurvedic Holistic body treatment for utter relaxation. While Miami knows how to stay busy — from boating and dining, to shopping and a night out on the town — at its heart, this is a laid back beach city where the value of some rest and relaxation are well understood. Miami is home to some of the best spas in the Americas, and its hotels — thanks to distinctive Art Deco architecture and beachfront locales — are some of the most unique. Combine the two, with amazing spas in beautiful hotels, and you have a match made in heaven. Here are the places to relax, recharge and slumber when visiting Miami. So leave your boat in the new superyacht marina and indulge in a treatment or two. The Mandarin Oriental’s spa sprawls over three floors and offers six VIP spa suites, with floor-to-ceiling windows overlooking the bay, that are available hourly with unlimited spa services creating the ultimate luxury experience. Pair one of the signature Mandarin Oriental therapies with the Ayurvedic Holistic body treatment for utter relaxation. Innovative and imaginative, The Standard Spa is unlike any other Miami offering — aside from the multitude of yoga and fitness classes, guests can enjoy a salt water infinity pool, world famous mud lounge, treatment baths, a Turkish-style hammam, aromatherapy steam room, Roman waterfall hot tub, Finnish sauna and arctic plunge pool. 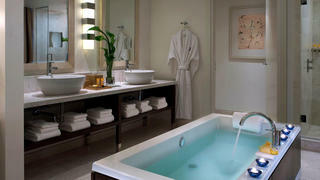 In addition to the range of head-to-toe treatments, guests can also take part in wellness workshops and special events. The Spa at Carillon is the largest luxury spa on Miami Beach — guests can enjoy a 70,000 sq ft. wellness playground with incredible ocean views. As well as a huge range of high end treatments, guests can also opt for acupuncture, personal training and sessions with a nutritionist in order to gain the maximum benefits from their stay. Stroll from room to room with the Thermal Experience, a series of multi-sensory rooms including a herbal laconium and Finnish sauna all designed to improve circulation and to revitalise tired skin. 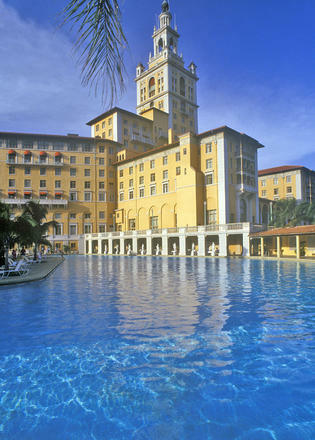 Set in Coral Gables, the elegant Biltmore Hotel is Miami’s classic beauty and a National Historical Landmark. Opened in 1926, the 273-room hotel underwent a renovation in 2007, maintaining its Mediterranean-revival style. Amenities include a golf course and spa. 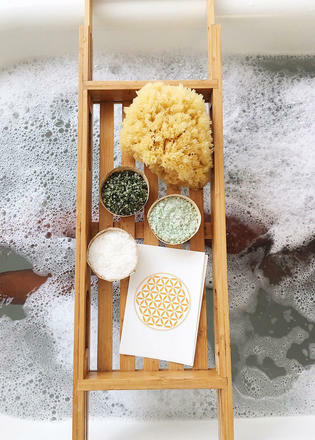 With a range of treatments to choose from, why not combine the signature Chardonnay sugar scrub with an advanced repair facial — with wine-inspired spa treatments taking the world by storm, it's the ultimate luxury experience. The Kimpton Epic's downtown Miami spa, Exhale, is dedicated to its guests wellbeing, both inside and out. This stunning sanctuary covers 12,000 sq ft. and houses a gym, Barre and yoga studios, mani-pedi bar, infra-red sauna and treatments ranging from facials and body scrubs to waxing and acu-healing. 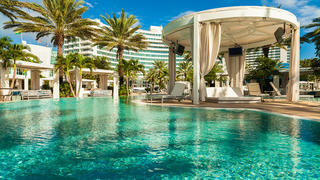 Wrap up at Miami’s iconic Fontainebleau Miami Beach Hotel with one of the ocean-inspired body wraps, just one of the vast array of treatments offered at the Lapis Spa. One of the best luxury spas in Miami, visitors can relax with mineral pools, massage-jet showers and eucalyptus steam baths making this the perfect spot for complete self-renewal. Just a few of the stand out treatments include the jet lag antidote, the lapis hammam baths and the lavish nirvana treatment, but guests can also head to the gym for a spot of personal training or to the salon for hair and nail treatments.